OMEGALUX™ QF Series heaters are very popular infrared panel heaters used in a wide variety of applications. The QF series panel heaters’ radiant surface is constructed through a patented process using bonded high temperature cloth quartz. A black coating is applied to the face of the heater for greater emissivity. A 2.5 cm (1") thick ceramic fiber refractory board is grooved out to support the precision resistance coils. 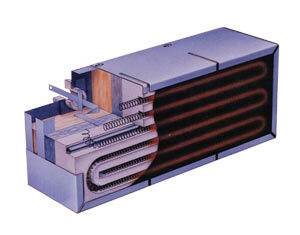 The resistance coil is then housed into the grooved-out refractory board. A layer of durable, high temperature, cement is used to bond the quartz face to the resistance coils as well as to the refractory coil support. The resistance coils used are an iron/chromium/aluminum alloy which can operate up to 1315°C (2400°F). These are then welded to stainless terminals which are routed to the back of the heater for external electrical connections. The welding insures the best possible electrical path. By changing to stainless buss bars and terminals, the conductivity is increased, insuring less heat buildup in the terminals. The heater board is then backed up by a high temperature insulation to prevent back heat loss. Finally, this is all packaged in a sturdy aluminized steel frame. Note: QF series heaters are intended for “radiant” heat. Never let material to be heated come into direct contact with the face of the heater. It is recommended that overtemperature control be used to prevent overheating. Fire and electrical shock may result if products are used improperly or installed or used by non-qualified personnel.